When the Royal Canadian Air Force opened the Air Mobility Training Centre in September 2012, it unveiled one of the most advanced air crew training and technician systems in the world. The $40 million facility in Trenton is the home of 426 Transport Squadron and a unique centre for the preparation of the crews who will operate the Canadian Armed Forces’ recently acquired fleet of 17 CC-130J Hercules transport aircraft. Later this year, the RCAF will officially open the doors to a similar centre in Petawawa for the crews of the incoming fleet of 15 new CH-147 Chinook helicopters. Both centres are part of the Operational Training Systems Provider (OTSP) program, a contract awarded to Montreal’s CAE in 2009 to provide comprehensive training through a mix of in-class, computer-based and simulated learning. They are also a harbinger of new thinking about training solutions as budgets decrease and militaries seek synergies across their fleets. Mike Greenley is the newly appointed vice president and general manager of CAE Military Canada. He rejoined CAE in October after almost six years with General Dynamics Canada. CAE is involved in mission system and command and control and ISR solutions for a range of army, navy and air force platforms, but it is world renowned for its training and simulation programs. Explain the Operational Training Support Program. This has been credited by some for setting a new standard for training. We work with the air force to understand the training requirement, what knowledge, skills and abilities need to be developed in the air crew and the maintainers, and then design an integrated solution. Everything is on the table when we do that, which is an emerging trend. We have classroom-based training with an instructor; computer-based training where you learn all the knobs, switches, dials and task flows; part-task trainers where you sit in a device, maybe a representation of the aircraft cockpit, and learn a task; then stationary full mission trainers; and then full motion trainers that can all be networked to conduct a scenario-based mission rehearsal. You have the entire training solution and all the courseware and you are able to optimize what skills you are developing under which media so that you can get the most cost-effective, highest quality training. It is a great opportunity for us – we get to use all of our skills. As you move up that scale from classroom to full motion simulator and eventually live exercises, it typically becomes more expensive. So we are always motivated to drive the training experience down the fidelity curve so that we can develop the required level of skill at the lowest affordable level of media fidelity. But you can only really do that if you are tasked to develop the complete, integrated training solution. Militaries are also starting to pay closer attention in this fiscal climate to what they call point of need: delivering training to the student at their point of need. It is always most expensive to fly somebody somewhere, put them in a live aircraft and have them fly around. If they can start their training through exposure in a classroom close to where they live and work, then access course modules through a defence wide area network on an assigned laptop, it becomes more personal, flexible and affordable. At the high end, with full mission, full motion simulation environments that we can network together, we end up with tactical control centres through which we can introduce distributed mission training. That allows the air force from a multi-aircraft or squadron or formation level to conduct higher order training experiences or conduct mission rehearsal that they couldn’t otherwise simulate in live aircraft. We can create the synthetic environment for troublesome situations or challenging battlefield scenarios that you could not replicate with live aircraft. That allows us to do distributed mission training and rehearsal prior to deployment. In some countries where we operate these types of centres, they will have regular simulated wars to keep the crews at the highest level of mission readiness or we will simulate the place where they are about to be deployed to prepare them for that environment. How significant a change is this from the traditional approach? Traditionally, militaries have been more the training system integrator. They would do their training needs analysis, decide how much they wanted done in a classroom, on computers, in simulators, and then they would run a contract for each of those and manage all of those contractor relationships. Many now realize the value of partnering with one contractor, making that contractor the training system integrator, which offloads a lot of that work from the military and puts the onus on the contractor to develop a full training system. Often contracts are performance-based over 20 years, so we have a performance-based motivation to deliver a high performing training solution at the right price point. That’s a great procurement model for the military and a great opportunity for us. And when we do that on more than one platform we are able to leverage synergies. Certainly each aircraft has its own nuances, its own curriculum, its own skills that need to be developed, but there are generic aspects such as infrastructure and terrain databases that you need to have in all your simulators. Is this a global phenomenon? How distinct is the RCAF approach? We do see the pattern of training centre procurement increasing. We are involved in operating over 40 military and civil training centres around the world, not just for air forces but also land and maritime. We are also involved in emergency management training centres. It’s a similar pattern: complex mission scenarios that require training for individual and crew skills that are hard to create either cost-effectively or from a safety perspective in a live training environment. The Canadian procurement is pretty advanced compared to other countries. With the C-130J training centre in Trenton, even Americans who have visited have commented that they view it as one of the most modern centres in the world, which is high praise coming from the U.S., which can generally afford to do much more than us. It’s not that Canada spent more money, it’s because it has been procured as a fully integrated system. Both the C-130J and the CH-147 centres are world class examples that other countries are now looking to. Is there a role for contractors in helping define the military’s skill sets, especially in newer areas like sensor operators and mission systems management where you are often also the technology developer and perhaps understand the necessary skill sets better? To a limited extent. The military does most of the definitions of the functions of the crew and their roles. You are making assumptions about the knowledge, skills and ability of each of those roles when you are assigning functions to each, and sometimes we get the opportunity to be involved in that discussion. But typically we would join in once we know it’s going to be a four-person crew and with set roles. Once we know that’s how the system has been designed, we would analyze the requirements for each of those roles and indentify the training needs. Obviously the more upstream we can get involved with the system design community, the more effective we can be at optimizing the knowledge, skill and ability development that we are going to be responsible for downstream. But if you look at something like the next generation fighter, where we have been responsible for the mission systems and support for 25 years, we have a lot to offer into a conversation on crew training. The RCAF’s longer-term goal is to network both centres. That idea has been around for years but is it now in greater demand? There has been a conversation in the community about distributed mission training and connectivity – across live, virtual and constructive – for 15 years and every year we make bigger strides. For distributed mission training (DMT) to be effective, though, militaries have to take a cross-platform approach. We’ve seen the first examples of DMT come into effect in exercises: people used to get all the assets together and run a live exercise; now they are linking simulators and running a simulation exercise. And when we deliver a training solution like in Trenton, it is designed to ensure it is networkable so a formation of C-130Js can train together. But now to go across platforms and have, for example, all the simulators for helicopters, transport aircraft, fighters and tankers connected in a scenario, the air force has to have a structure whereby it is going to manage training and simulation across platforms. Air forces around the world are starting to do that. Canada has established new positions in the air force in the last couple of years to look at cross-air force training and simulation, not just for an exercise but as part of everyday operations. For CAE, we have contracts to support, operate or maintain training environments for the air force across the country. Though we don’t have a contract that says, “work across all these platform stovepipes and cause there to be a systematic approach,” we try our best to look across all the platforms we are delivering training on and help the air force bring a cross-fleet perspective to this as they are trying to cause DMT. That, in turn, causes us to help set standards: what are the training database standards going to be, the network standards, the federation network models for this distributed mission training? This is going to increase. In Canada, we are seeing the air force and army look at DMT activities so that you can have air support to ground operations in the distributed mission environment. Most procurement around simulation systems, though, seems to be platform driven. At some point do you need to separate the training from the platforms and look at it in a much more holistic way? If militaries want to have that system-of-systems approach to training, the opportunity is there. Instead of procuring at the platform level, you could procure across the fleet; we would then deliver an integrated training solution at the fleet level. You get more flexibility, more opportunity to optimize the knowledge, skill and ability development, more optimization of resources, and more sharing from a pan–fleet perspective. That can work, but sometimes the commercial contracts for each platform get in the way of trying to cause cross-fleet synergy. I am seeing some countries in Europe now starting to switch from procuring ISS (in-service support) for each platform to contracts that are across fleet – instead of buying ISS with each armoured vehicle, they now want an armoured fleet maintainer to have the ISS and drive synergies across the fleet. For things like training, ISS and C4ISR, where you want a common C4ISR solution on every platform, there are opportunities to look across the fleet and encourage those synergies and interoperability. Is the army taking this approach with the Land Vehicle Crew Training System? That opportunity would be there. If you look at how the army deals with C3, command, control and communications, Director Land Command Systems Program Management has contracts with General Dynamics and Thales that are cross-army contracts so that it ends up with integrated C3 across the fleet instead of different C3 solutions on each vehicle. We are in conversations with many different countries that want to take that approach. Given where technology is today, many are asking how industry can partner with the military to be the training system integrator and deliver the cross-fleet solution. As military budgets get tight, the other increasing opportunity is for us to actually own the training centre and for the military to pay for it as a service. That is another level of partnership. For both militaries and emergency management, that is a conversation many are having around the world. We do that on the civil side every day. We have dozens of civil training centres for Boeing, Airbus and business jet aircraft where we own the centre and deliver training as a service. Does that conversation also extend across domains as well as across fleets, given that all these platforms need to be networked? 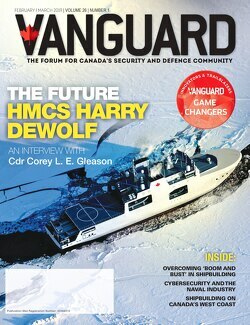 In smaller countries that are more in the “development” phase of their defence capability and have a smaller force and more centralized thinking, there is an opportunity to take a pan-force perspective and act more “joint” than some of the more developed countries with established army, navy and air force cultures. But as budgets get cut and money gets tight, I think that will drive more joint behaviour in western nations. Shrinking budgets can knock down stovepipes pretty quickly. Are militaries creating new units or positions to hold these discussions with you? In some countries. In Canada it is still an army, navy, air force discussion. With the evolution of the Canadian Defence Academy, I think there is an opportunity to have a Canadian armed forces training conversation as the CDA continues to mature and have more influence in the community. Certainly the operational training tends to live within the army, navy and air force, but CDA gives you the place to have that joint training conversation, to look across the force at skill development as part of skill generation. You’ve touched on a few trends. Take us out five to 10 years: what does training look like for a trooper? One trend is the concept of point of need. It is expensive to have someone leave their job, fly somewhere, and be locked in a classroom. We have to constantly look at the mix of classroom-based, computer-based and simulation-based training and how to make it easily accessible. How can we decrease the cost of expensive facilities and instructors and get more e-learning and, at the higher end, more simulation-based training instead of live vehicles or aircraft? The use of connected simulation environments will also continue to grow. I also see a potential trend in more performance-based learning frameworks, using behavioural science and our understanding of knowledge, skills and ability to figure out how to develop those skills and then how to test them. That’s advanced training thinking. It allows you to move students through their educational experience at their pace while ensuring they meet a performance level. When you combine those things, you are saying: how do I make training more accessible, how do I ensure I am using the most cost-effective yet richest training media experience, and how am I measuring the student on a performance basis so that once they have the skill they can move on to the next? That is going to be increasingly more important. People talk about the next 10 years as being one of “home deployed” forces. We’re pulling out of Afghanistan and people don’t see a lot of scenarios for large deployments. If I have shrinking budgets and home deployed forces yet I must maintain readiness at the most cost-effective level possible, my ability to use this technology for training and distributed mission rehearsal will be critical.